Small businesses appreciate a good strategy for saving money. And what better way to save money and time than by automating repetitive and arduous operations in your business? Many of the processes consuming valuable time in your HR department can benefit from automation. HR software tools for small businesses like BambooHR, Zoho People and Ximble can boost efficiency and eliminate chances for human error in your business, saving you significant money in the process. So, how much money can you really save using HR software? BambooHR, a company providing human resources software as a service, highlights some of the areas an HR software can help your business save money in a recent infographic. The Lindon, Utah-based HR firm uses a hypothetical company and a hypothetical HR professional, Caroline, to demonstrate the benefits of integrating HR software and automation into your business operations. The savings highlighted are significant. One of the biggest savings is in onboarding, where automation of the processes involved can save a small business roughly 50% over traditional methods. According to BambooHR, the traditional onboarding process, with all of its paperwork and training, consumes about 11 hours of Caroline’s week or $363 in HR time (11 hours x $33 per hour) whenever there’s a new hire. Automating onboarding can cut this time in half, which quickly adds up when you consider how many new hires your business makes in a year. Another benefit of automation comes when tracking down and signing business documents and forms. According to BambooHR, you can save time and money by implementing e-signature software in your business. “E-signature software can save an average organization up to 40 working hours each month,” says BambooHR. “Plus, with digital documents, you can also save about $20 per document on printing and postage costs.” That adds up to savings of $920 (40 work hours x $23 per hour) each month, or $11,000 in annual savings. Implementing time-off management software saves Caroline (and other HR professionals) not only time, but also the cost of unreported paid time-off (PTO). This is because the software improves time-off tracking capabilities and your HR team doesn’t have to keep track of employee vacation time using manual spreadsheets. According BambooHR, an average employee takes up to three unreported days of PTO a year when their organization has poor tracking capabilities. But, with HR time-off tracking software, you could save $184 a day for a single employee earning $46,000 per year, or save $552 annually per employee. 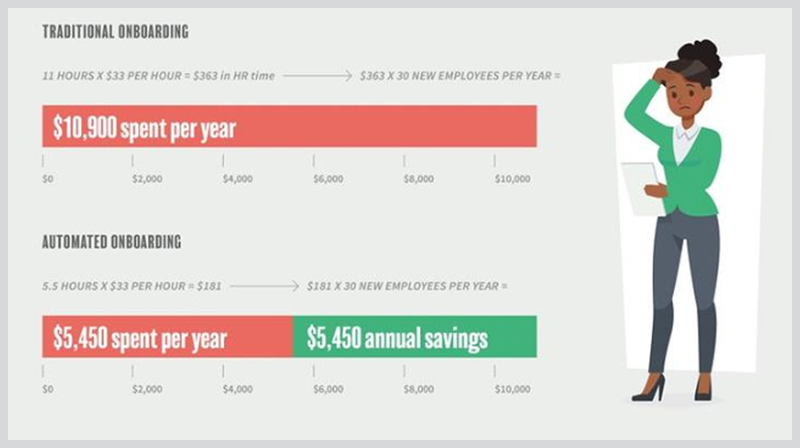 Check out BambooHR’s insightful infographic in its entirety below for more details on how much time and money the right HR software can save your business.